The Lake District is known for its gingerbread from Grasmere and mint cake from Kendal and now it is hoping to develop its own whisky industry. Andrew Currie, who has experience of producing whisky in Scotland, wants to open a distillery at a former wood yard in Staveley. Permission has already been granted to produce Lakeland Malt and he is now looking to develop the building. Mr Currie said the River Kent water "deserved to be turned into whisky". He wants to produce a high quality single malt using water coming from the River Kent. He said: "I think the whole area is fantastic for making whisky." He added: "At Staveley, we have the River Kent, England's fastest-flowing river, it is water that deserves to be turned into whisky. "We are trying to source the barley as locally as possible but there is a lot of rain around so we may have to go east." He said that although there is no tradition of whisky producing in Cumbria, there has been a lot of illegal whisky produced in the area over the past 200 years. 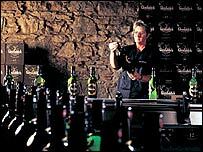 At beginning of 19th century there were more distilleries in the north of England than the whole of Scotland, he said. Mr Currie plans to produce 25,000 litres each year, a small amount compared to the one million litres produced by Scottish distilleries, but he said the product will be of a very high quality. But those who want to taste it will have to wait at least three years, and preferably far longer, for the whisky to mature.